It promises to be a weekend of destiny for Derbyshire Arrows after three of their five teams reached the end-of-season play-offs. The senior men secured a fine sixth placed finish in the Second Division of the National Men’s Basketball League, and will travel to meet Liverpool in the quarter-finals. Liverpool finished third, 12 points in front of Linbraze Arrows, and are sure to have a partisan home crowd cheering them on this weekend. But Arrows will be led by their star player Joseph Baugh, who has enjoyed another superb season, and they hope not to be fazed by the occasion. 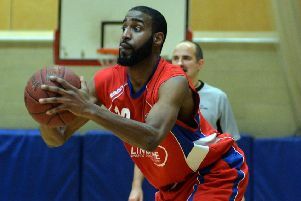 In their final match of the league season proper, Arrows took on another top-four outfit in Essex Leopards. It was a dead rubber that meant little, but after a scorefest, they found themselves on the wrong end of a 114-82 scoreline. It’s also play-offs weekend for the Arrows’ senior women’s side, Encon Derbyshire Gems, who host Cardiff City in the quarter-finals at Dronfield Sports Centre on Sunday. In only their second season in Division Two of the Derbyshire Women’s Basketball League, Gems improved again to finish runners-up, albeit ten points adrift of champions Ipswich. Kate Loftus has spearheaded Gems’ progress over the last three successful years and will again be looking to lead by example against Cardiff. The match also gives her the ideal opportunity to erase from her memory last year’s play-off game when she played bravely with a serious knee-injury, only for the day to end in heartache. This season, Gems have evolved further with the arrival of players such as Jo Clayden, Steph Ogdon and guard Nerea Josebe and so they should be much healthier and better prepared than before. Home advantage will also be in their favour as Gems’ supporters turn out in numbers to cheer on their local team. It is an amazing achievement by the family-orientated Arrows club to get three teams into the play-offs, and the triumvirate is completed by the all-conquering U14s, who were crowned champions of the North division in the National Basketball League after winning all 16 of their matches. Led by the highly-rated Isaac Askwith, they now travel to face another undefeated outfit, Lancashire Spinners, in the last 32 of the national championships for what will be their toughest examination so far this season.